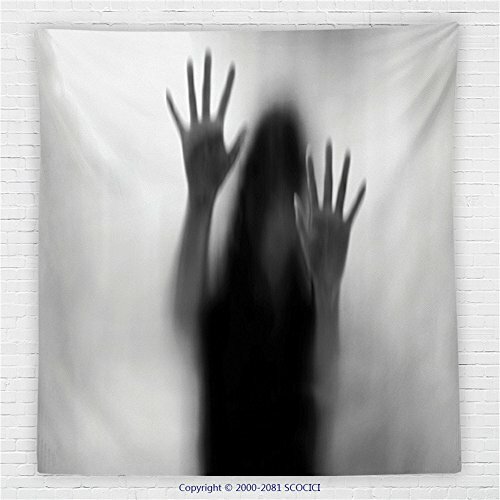 59 x 59 Inches Horror House Decor Fleece Throw Blanket Silhouette of Woman behind the Veil Scared to Death Obscured Paranormal Photo Blanket Gray by iPrint at UtopyaCon. MPN: MTF6207911S150X150. Hurry! Limited time offer. Offer valid only while supplies last. Comfortable Supersoft Throw Fleece Blanket: it's warmer and thicker than the traditional fleece blanket while still producing a high-quality image. Comfortable Supersoft Throw Fleece Blanket: it's warmer and thicker than the traditional fleece blanket while still producing a high-quality image. It's comfortable keepsake that provides ultimate warmth . Our throws are machine washable! Backed by 100% Satisfaction Guarantee. Buy one today with confidence! Size:59 x 59 Inches, 150cm x 150cm. Special customized service, you can be your own designer, just send us any pictures.